Media outlets complain the Obama administration is restricting access they’ve had in the past. NBC’s Kristen Welker reports. >>> president obama of course paid his respects to nelson mandela when he spoke at a memorial service in johannesburg on tuesday. 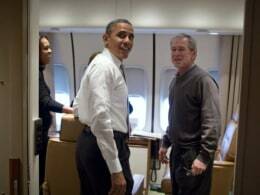 you may have seen these photos released by the white house , taken aboard air force one on the way to south africa . president bush and his wife laura, secretary of state hillary clinton traveled with the obamas. official photo releases like these are not. >> reporter: now at the central of an escalating battle between the white house and the news media over access and image control. our white house reporter has more. >> reporter: this sumter president and his former secretary of state had lunch at the white house . a newsworthy event. the news media weren't invited in. only the one given access? the official white house photographer. >> we're the first eyes and ears for the public. if we're not getting access to the president, the public isn't getting access to the president. >> reporter: he calls images like these pure prop ganld a. arguing the obama white house consistently blocks journalists from events they routinely covered in previous administrations. the most recent example, those photos of the historic air force one trip by two presidents to nelson mandela 's funeral. captured only through a white house lens while the press corps was in the back of the plain. >> the white house is getting the only control. >> reporter: 30 news organizations recently joined in a letter to the white house charging the administration is blocking the public from having an independent view of the executive branch of government . last week the fight boiled over in the briefing room with press secretary jay carney insisting the president values the independent media . >> we're going on work with the press and the photographers to try to address some of their concerns. >> reporter: historically presidents have tried to control their image through official photos but social media has made this government's pr push a lot easier. >> the availability of twitter, flicker, allows them to do it without any filter of the media. >> reporter: it is not only the press cameras being shuttered. denying the media unscripted answers that might be news worthy. >> his promises, consistent promise of a transparent administration led people to believe that the access would be different. that it would be greater.